I’m all thumbs when it comes to knitting. 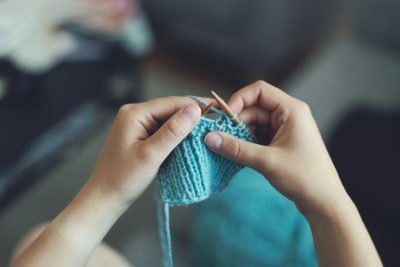 It takes perseverance to knit a sweater. My mother knitted me a sweater. She earned her living by knitting. She made a sweater from balls of yarn. She wound the woolen yarn into a ball. That yarn is beautiful. What are you going to make it into? The ball of yarn just won’t come untangled. While I was reading a book, my mother was knitting.